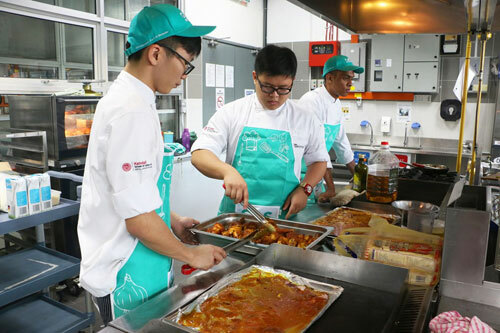 Students and chefs from the School of Hospitality at INTI International College Penang showed true heart by cooking and distributing food to more than 1000 less fortunate Penangites. The project, titled Food for All, is one of many projects organised by various faculties at each of INTI’s campus in putting their skills and knowledge to serving their communities. Students from INTI Penang’s School of Hospitality (SOHOS) preparing food at the campus’ dedicated training kitchens. More than 40 students along with four chefs, two lecturers and two administrative staff came together the evening before to cut and prepare the food. The following morning saw a hive of activity as students cooked, packed and delivered the food at eight different locations, including, the Kenali Maahad Al-Arkan, a home for Burmese children of Rohingya descent; Madrasah Tahfizul Quaranulkarim Baitul Irfan; the Children’s Protection Society; Intan Old Folks Home; Wisma Anak Yatim Perempuan Pulau Pinang; St Joseph’s Home; as well as a smaller orphanage in Taman Pekaka and a food bank for the homeless. INTI students and staff delivering food to St Joseph’s home. Adding another element of community involvement, the faculty approached and secured a number sponsors from as far as Kedah and Perlis to provide some of the food items and packaging. The sponsors included Metta Maitri Sdn Bhd, Kilang Beras Pering (Kedah) Sdn Bhd, the Kuala Perlis Community, Kudrat Murni Enterprise, and Es Ea Trading Sdn Bhd. The project taught students valuable lessons, both in helping the less fortunate as well as appreciating what they have in their lives, and is yet another way through which INTI helps its students to gain more than just the academic knowledge of their classrooms.